Tip is at 12:01 on ESPNU! As always, I'll have live play-by-play and post-game interviews here. Eli hits a jumper and a layup to start off the game! Tigers lead 4-0. Mitchell makes one of two at the free throw line. Tigers up 5-0. Wake hits a 3 to get on the board. Tigers lead by 2. SIMMS FOR 3!!! Great to see him get off to a good start! Tigers lead by 5. REED AND ONE!!! His first points of the game. Reed completes the 3-point play! Tigers lead by 8. SKARA FOR 3!!! Tigers lead by 11! Reed layup puts the Tigers up by 13! He has 5. Hoard cuts the lead to 11. NEWMAN FOR 3!!! Third different Tiger to hit a 3 already, and Reed and Mitchell haven't hit one yet. Tigers lead by 14. Hoard cuts the lead to 12. ELI AND ONE!!! He completes the 3-point play. Tigers lead by 15. ELI DUNK!!! Tigers lead by 17 with 7:30 left in the half! Wake hits a jumper to cut the lead to 15. Emphatic block by Javan White! Lead is still 15 with 4 minutes left. JAVAN WHITE DUNK!!! Nice look from Mitchell. Tigers lead by 17 again with 3:30 left in the half. Wake hits a 3 to cut the lead to 14. Wake makes a couple free throws to cut the lead to 12 with 2:15 left in the half. Reed tough basket with the shot clock winding down! Tigers lead by 14. Mitchell misses a wide open 3 from the top of the key and Wake scores a layup at the other end. Tigers lead by 12 with about a minute left in the half. Reed misses a finger roll, but Eli rebounds and is fouled. He'll shoot one-and-one. Eli makes both! Tigers lead by 14 with 49 seconds left in the half. Hoard scores again to cut the lead to 12. Tigers will get last shot of the half. Reed loses his dribble and turns it over. 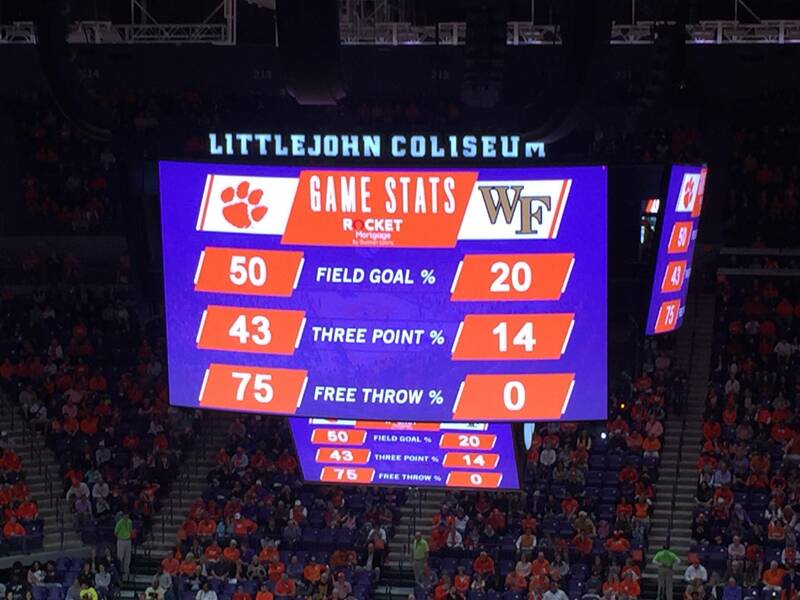 Wake's half-court shot doesn't go. Sharone Wright's son is scoreless so far. TIGERS LEAD 30-18 AT THE HALF. Eli leads the Tigers with 11, Reed has 7. Tigers are just 3-9 from 3, and Reed/Mitchell are surprisingly 0-5 from 3. Eli makes a great save out of bounds, over his head, finding Mitchell at half court! Should have been goal tending on Mitchell's layup, but Simms cleaned it up for a layup. Tigers lead by 14. ELI DUNK!!! Nice no-look pass from Mitchell. Tigers lead by 16! Wake finally scores for the first time in the half. Tigers lead by 14. Eli one-hander off the glass! Tigers lead by 16, Eli has 15. Skara offensive rebound and drives for a layup! Tigers lead by 18, biggest lead of the game! Reed drives for a layup! 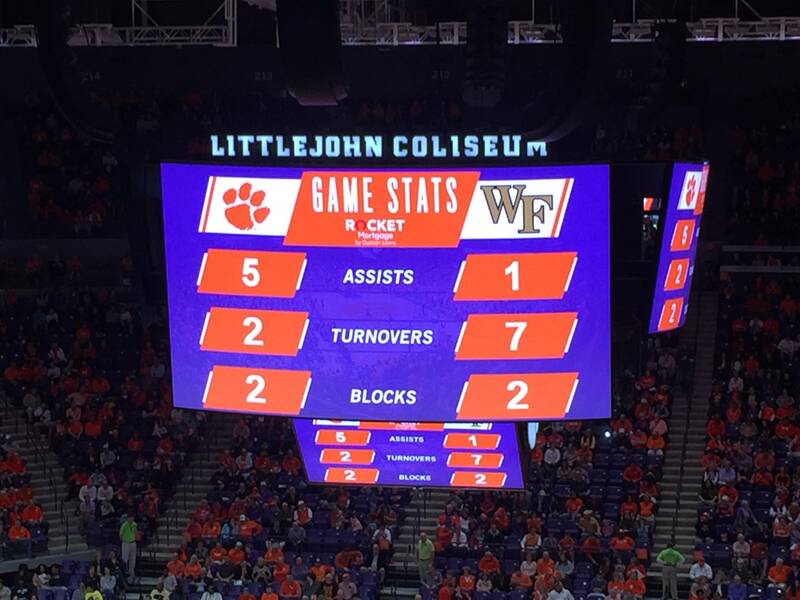 Tigers have doubled Wake up, they lead by 20 with 15 mins left! Eli with a nice spin move and layup! He has 17, Tigers lead by 22! MITCHELL FOR 3!!! First 3 of the game for Mitchell or Reed! Tigers lead by 25 with under 14 mins left. Wake scores a couple baskets to cut the lead to 21, but Eli answers to push the lead to 23! He has 19. Skara layup on a pass from Eli. Tigers lead by 23 with 8 mins left. Hoard scores again to cut the lead to 21. Eli scores again! He has 21, Tigers lead by 23. NEWMAN FOR 3!!! His 2nd of the game! Tigers lead by 26 with 5:30 left. Wake cuts the lead to 24. Eli again! He has 23! Tigers lead by 26 again. MITCHELL AND ONE!!! Jemison into the game for the Tigers with 4:15 left. Mitchell misses the free throw. Tigers lead by 28 with 4 mins left. Mucius cuts the lead to 26. I'm headed down to the court. I'll have post-game interviews posted in a bit! Biggest roar of the game came when Lyles Davis hit a 3! Lol Crowd was chanting for him to come in, and he hit a 3 shortly after they got their wish. TIGERS WIN 64-37!!! I'll have interviews posted shortly!